Every year the company I work for takes part in the Enduro Challenge. This is an endurance relay event where a team of 6 athletes race from Tower to Tower – The Tower of London to The Eiffel Tower. Teams run from London to Dover, swim across the English Channel (in only a swimming costume!) and then cycle from Calais to Paris. Yes, this is an extreme triathlon! I’ve taken part a couple of times and have helped support the race the last few years too. It’s an enormous amount of fun and incredibly hard work and the athletes that take part are thoroughly deserving of plenty of homemade cakes! So it has become a tradition that I supply some home baked goodies, preferably themed for the event. 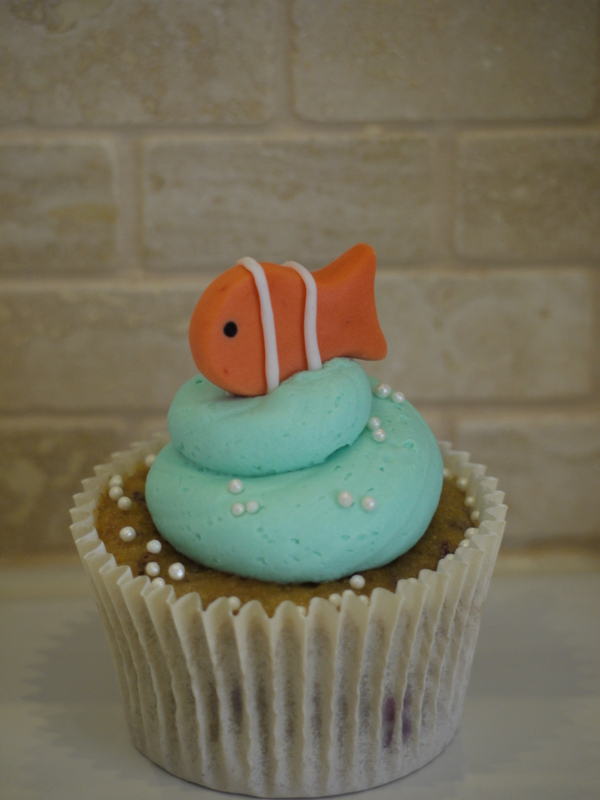 So this year I have been busy baking some sea creature cupcakes. 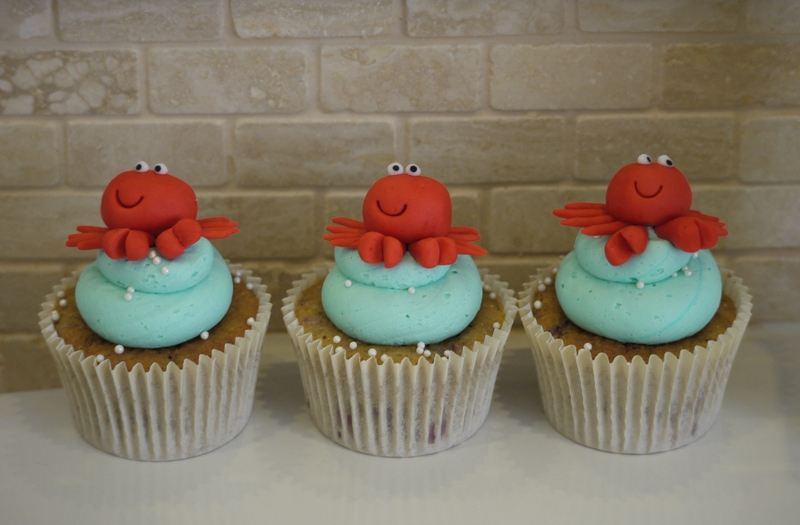 The cupcakes were relatively simple to decorate, you can use the photos as a guide to make the fondant sea creatures. The only tricky part was making the swirl for the water coming out of the top of the whale. It’s probably best to make these in advance so they have time to harden. I used white flower paste as I thought this gave it the best chance of holding it’s shape and not going floppy. Roll a small amount out into a thin line and then flatten slightly with a rolling pin or you could use your finger. Dampen the top edge and start to roll up from one end, you won’t need to roll very much. Cut, leaving 1.5cm of straight fondant coming out the end of the swirl. Make 2 per whale, one slightly larger than the other. Next dampen the outer edge of the straight bit and stick 2 swirls together as in the picture. Leave to one side to harden. In a bid to try and hold on to summer for as long as possible, I decided to make pink lemonade cupcakes. 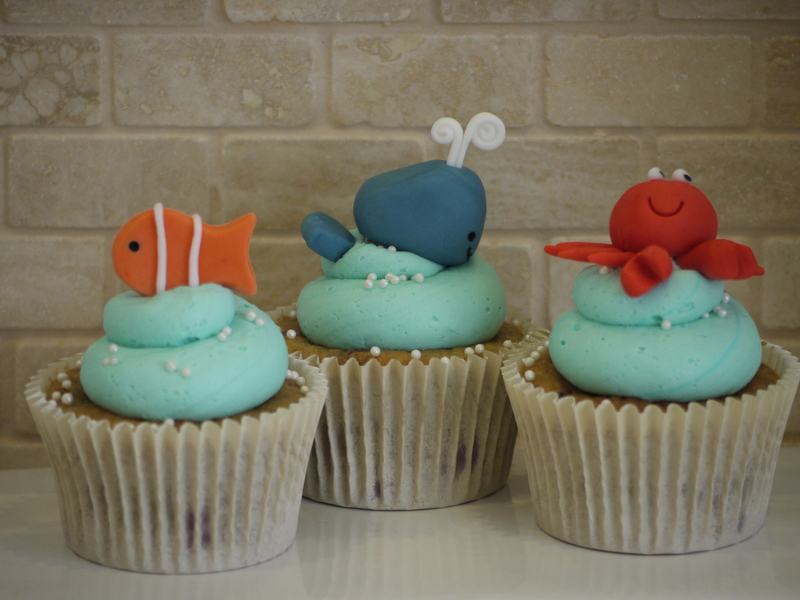 The recipe for the cupcakes and buttercream are below… happy baking! Mix the sugar, flour, butter, baking powder, salt and lemon zest together in a stand mixer (or rub in with your hands) until the mixture resembles fine breadcrumbs. Beat the milk, eggs and lemonade syrup together in a jug and then gradually beat into the dry ingredients until smooth (ensuring that you scrape down the sides of the bowls after each addition). Blitz the frozen raspberries in a food processor until you have small pieces; don’t over do them or they will melt and turn into a mush! Fold the raspberry pieces into the cake mixture. Divide the mixture evenly between the 16 cases, as you spoon it out you should see the raspberry pieces are starting to melt and create a pink swirl effect. Then bake in the oven for 18-20 minutes until they are lightly browned on top and spring back when pressed (and a skewer comes out clean). I usually check them and turn them around after 15 minutes. Take out the tins immediately and leave to cool on a wire rack. Decorate once completely cool. Beat the icing sugar and butter together on a very slow speed until the mixture resembles coarse breadcrumbs. I always put a tea towel over the top of my KitchenAid to prevent icing sugar going everywhere! Then slowly add the milk, lemonade syrup and lemon zest along with some ice blue paste food colouring. Once it’s all been added increase the speed and beat on high for 5 minutes until light and fluffy. Please note that this is meant to make enough for one batch of cupcakes i.e. 16 but I find it makes way too much! I actually halve it and still end up with plenty to ice 16 cupcakes!